In 1991 November 24th, Freddie Mercury died. This was the end of an immense rock band… and the beginning ot a new myth! Indeed, few rock bands can mingle disparate styles such as rock, opera, funk, electro and write masterly orchestrations valuing the feats of its own lead singer. Freddie’s sense of drama strongly influenced Frederick Caramia. He started his singer’s carreer at the age of 16, already covering some Queen hits. After studying lyrical singing with teachers of the "Opera de Paris", Frederick decided in 2005 to create a coverband, supported by his brother. Alexandre Caramia plays the drums and shows equal vocal ease. The first performances were welcomed by enthousiastic audiences –most were faithful Queen fans. Thanks to their friends in the show-business, Fred and Alex have added great musicians to their team. A professional bass player, Morgan Michaud aka "Morgus" and a guitarist, Adrien Husson, who plays scrupulously Brian May’s solos, joined the Caramia Bros. The pianist-singer and professionnal composer, Eddy Pero was last recruited by the band. 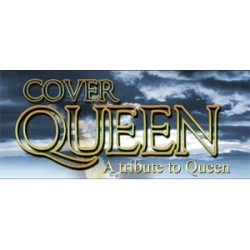 They cover Queen and are named COVERQUEEN, a tribute to Queen. Songs like comme " Tie your mother down ", " I want to break free ", " Bohemian Rhapsody ", " Somebody to love ", " The show must go on " are played with absolute integrity and respect. Their special energy on stage and the musical versatiliy of the musicians (all are multi-instrumentalists and back-vocalists) hold moments that can’t be missed for Queen nostalgics. "Here we are..."